First up, I love Bloom Remedies. I now use their Daily Revive Facial Oil, Hydrating Floral Toner everyday and am currently trying out their Deep Release Bath Oil and Daily Cream Cleanser ….. going well so far. 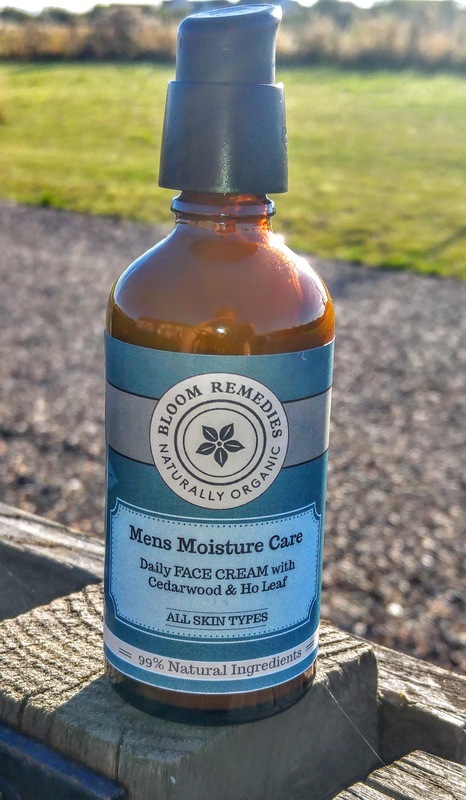 When I placed my last order online I also added in the multi-award winning Mens Moisture Care to the cart. This daily face cream has an ingredient list that is 99% natural. The wonderfully light yet nourishing cream is beautiful blend of hardworking essential oils and floral waters. I actually cannot get over how intoxicating the smell it. The smell alone would make for a wonderful aftershave! I love that all Bloom Remedies products are handmade and are free from all the nasties like SLS, PEGs, parabens and pthalates. This Cornish brand knows it’s stuff when it comes to skincare and this Mens Moisture Care really does have an impeccable list of ingredients to work on the skin. It is moisturising where it needs to be, balancing where it needs to be, refreshing post shave and also healing on the skin. My male tester loves the fact that this product also has reduced their shaving rash frequency!